The Open Bioactive Compounds Journal is an Open Access online journal, which publishes original research articles, letters, review articles, short articles and guest edited single topic issues on bioactive compounds. The Open Bioactive Compounds Journal, a peer-reviewed journal, is an important and reliable source of current information on developments and research in new bioactive compounds with proven activities in various biological screenings and pharmacological models. The aim is to provide a valuable information source of bioactive compounds synthesized or isolated, which can be used for further development of pharmaceuticals by industry and academia. 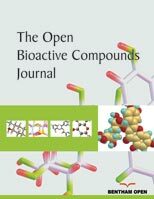 The emphasis will be on publishing quality papers rapidly and freely available to researchers worldwide, proving essential reading for pharmacologists, pharmaceutical chemists and medicinal chemists who wish to be kept informed and up-to-date with the latest and most important developments about new bioactive compounds of natural or synthetic origin, including recent patents.